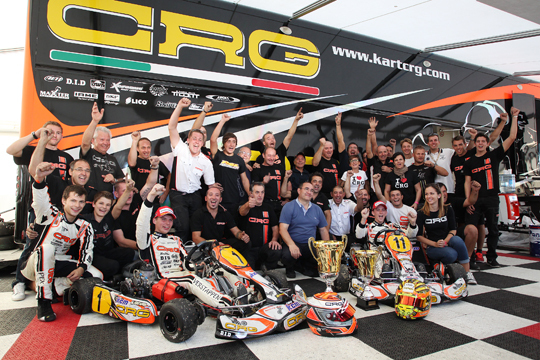 Crg and Max Verstappen new World Champions! Another great team result has been achieved by CRG in France at the circuit of Varennes sur Allier. Max Verstappen won the KZ World Championship being now the youngest driver ever to win the title in the category with the shift. Lennox was also on the podium with an excellent third. Good performance by Tiene and Forè. Thonon forced to the retirement due to a technical problem. Varennes sur Allier (France). Another title for CRG and Max Verstappen that are unstoppable and unbeatable this year! Max Verstappen is the new KZ World Champion in the most powerful and with the shift category becoming the youngest driver in the history of this series to get the world title last weekend in Varennes, on the very fast Circuit Jean Brun. The Italian firm and the young Dutch driver (16 years of age next September 30th) got the fifth title in 2013 after winning the KZ1 European Championship, the KF European Championship, the WSK Euro Series KZ1 and the WSK Master Series KZ2, as well as the KF Winter Cup at the beginning of the year. In France it has been a triumph again and one obtained by a very young driver like Max, which launches the chances of youngsters in a category that has traditionally been veterans field. The 1.500 meters of the circuit of Varennes sur Allier, where slipstreams count a lot (the slipstream is worth 5km/h! ), Max Verstappen managed to gain since the beginning those meters that did not allow his rivals to get close enough. The Dutch driver of CRG with Tm engine prepared by his father, former F1 driver Jos Verstappen, put in the perfect weekend that climaxed in the victory of his Prefinal and in the awesome victory in the Final, scored with a 3 seconds gap to Leclerc and on team mate Lennox-Lamb that secured in a sprint the other two steps of the podium. This has been a team's victory once again as CRG team has been compact and with several drivers in the hunt for the victory. Aside Max Verstappen, the success at CRG was also built by Jordon Lennox-Lamb (CRG-Parilla), third at the flag and very competitive as always, Felice Tiene (CRG-Maxter), seventh only due to a bumping at the start of the race and Davide Forè (CRG-Tm), poleman in qualifying and stuck in a couple of quite harsh duels that relegated him to the final P12. In other words, all drivers have been among the main protagonists. Good performance also by Jorrit Pex (CRG-Tm), despite he could not get into the leading group due to several problems and finished 16th. He was followed by a very combative Fabian Federer (CRG-Maxter) in 17th. Alas, the Final missed the participation of 4 times world champion Jonathan Thonon (CRG-Maxter), who was forced to give up in the Prefinal due to a technical problem when he was counter-charging. Was it not for this, CRG could have scored a stunning hat-trick! IN KZ2 SPINELLI ON THE PODIUM BUT SUB-JUDICE. In the KZ2 CIK-FIA International Super Cup, CRG got on the podium with Loris Spinelli (CRG-Tm), second at the flag after a spectacular recover in a race full of twists. Unfortunately after the race the driver of team Modena Kart was penalyzed by 5 seconds for an overtaking move that was judged too harsh when he managed to get the lead. His team filed an appeal anyway and the classification is currently “sub-judice” with Boccolacci winner and Spinelli second ahead of Arrue. The sportive court will decide on the events validating or changing the final standings. The two CRG drivers Xen De Ruwe – very good performance at the debut in the category after his good performances in Rotax Trophies – and Giovanni Martinez – for the first time in a world championship final – managed to get into the KZ2 Final. De Ruwe ended with a good P12, while Martinez had to retire one third into the race while setting good lap times. Positive results for both drivers that competed on CRG-Maxter. “It's amazing, I didn't think it would have been so easy in the final as this track is all about slipstreaming, I have to thank CRG for the chassis, I was very happy with its balance as well as with my Dad's engine that was perfect. I won all the championships it's been a perfect season. Next November I will try to get the last International title of the season, KF World Championship in Bahrain. I am currently leading the standings and I hope I will manage to get such an important result to me and to the whole team”. Davide Forè: “Unfortunately in the Final I had a contact with Ardigò first and then with De Conto. I was close to the front runners and I think I could have got on the podium but I am quite happy anyway on how things went as we have always been among the front runners. It was great to get the pole position on Friday and I am happy for CRG's victory. My compliments go to Max Verstappen, he won everything he certainly is the driver of the year. Very many compliments to him and CRG as well as to my team DT and my preparator Daldosso who gave his best for me”.